TGIF! I’m home with a sick little guy today, which means during nap gives me a long time to peruse some of my favorite items. 2. I’ve been learning A LOT about essential oils, I’ve tried Young Living but really found that the best one for me and my family is Aura Cacia, I especially love their Baby essential oil line. I mainly use essential oils for cleaning and Aura Cacia gives great DIY cleaning ideas! I have yet to try the diaper pail spray but I think I’ll try it this weekend! Do you use essential oils? 3. Fall is in the air! Oh late Fall anyways. It’s pretty cold here lately and it’s time to switch over from summer bright nails to darker Fall tones! I’m a big Essie nail polish fan and this is a staple in my nail polish bag. I love this color. You can buy it pretty much anywhere, but if you are a online shopping type of gal here ya go! Go here to buy online! 4. Gray houses with white trim and a yellow door! No, that is not our house….our house does need to be painted however. 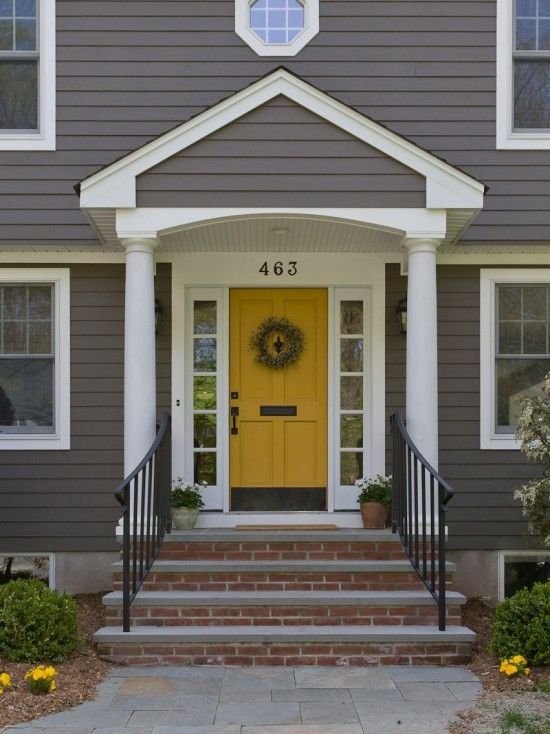 Curt and I talk about it a lot and have decided a dark gray with white trim and a yellow door is the way to go! I don’t know WHEN we will get around to it, but I LOVE this color combination. 5. We aren’t ready for a big boy bed just yet but when we are I think we will go with this Ikea bed! I saw it on a blog post and LOVE it! I love that you can lower it and add a canopy and have storage underneath when you raise it. I think I will paint it dark brown though. Alright, folks! Enjoy the rest of your day! It’s rainy and dreary here! I’m hoping the little one takes a LONG nap and starts to feel better soon!